Below are some recent comments from from a few of our clients. We hope you enjoy your experience as much as they did. I made my reservation rather late and Ken was very helpful explaining everything on the telephone and promptly sending an email confirmation. He was very polite and friendly from the first time I spoke with him on the telephone. At the event, out attendant was great with the students and adults who approached him. I would be happy to have California Chocolate Fountains at future events. Everything about my (our) experience with California Chocolate Fountains was phenomenal. I have heard positive comments from everyone. I look forward to seeing you at future events! I had to sell the idea of the chocolate fountain (and the cost) to my group, however; once everyone saw the fountain and the dipping items displayed, there was NO QUESTION that our money was well spent. Plus, the cost was comparable to serving plain cheesecake! I will definitely use and recommend California Chocolate Fountains in the future. The fountain was a big hit and guests of all ages enjoyed the variety of treats offered. We would definitely use the California Chocolate Fountains service again. The Chocolate Fountain was a huge hit at our event. So was our attendant, Stacey. I received as many glowing comments about Stacey's friendliness as I did about the chocolate! Our guests were just thrilled by the whole experience. California Chocolate Fountains added elegance, fun and camaraderie to our event. Because our outdoor activities were rained out, the Chocolate Fountain took on a primary role as social centerpiece, and it was a delightful success. Everyone mingled around the room recommending their favorite dipping items & guests kept returning for more! Stacey's professional, friendly interaction with our guests made the evening all the more cheerful. 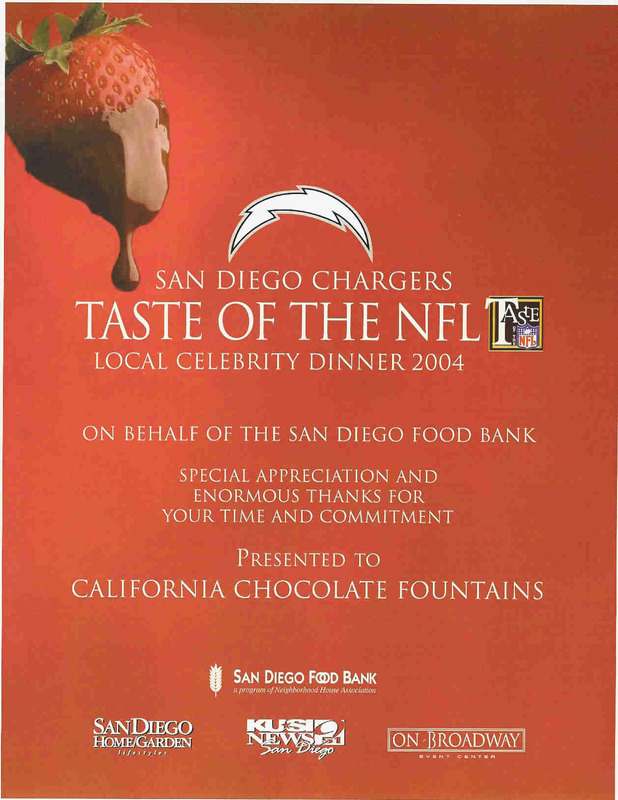 We couldn't be happier with the joy and value California Chocolate Fountains brought to our event. Thank you & see you at our next party! Everybody loved the Chocolate Fountains (one Milk chocolate and one White chocolate). The attendants were great. The display was beautiful. Definitely worth every penny! If I had to do it again, you would be the first company I'd call to book. Thanks! I have never been so pleased with a catering service! Not only did you call me back in a timely manner, but your rep so was extremely kind and helpful! Our attendant was very very very kind and professional! I had many compliments on my catering choice, many commented on the quality of our attendant! As joyous as weddings are, they are stressful! CCF, you were extremely helpful from the first phone call. Thank you for your professionalism, courtesy, and quality product! Everyone loved you! NICOLE WAS A DOLL AND EVERYTHING WENT VERY WELL! THIS WAS MY SECOND USE OF THE FOUNTAIN AND WILL BE MY FIRST RECOMMENDATION TO ANYONE NEEDING SOMETHING SPECIAL TO ADD TO A PARTY OR WEDDING. YOUR COMPANY IS THE GREATEST AND ABOVE ALL THE TASTIEST!!! I'm so glad you were available for my son's Bar Mitzvah. It was seriously the hit of the party! The fountain attendant was great, the fountain looked gorgeous, the treats were displayed beautifully, and above all, it was delicious. Thank you so much, I look forward to meeting you at Grad Night! All went very well, no problems at all and we were very pleased with the entire process. I've received several phone calls and emails that complimented the night and each have mentioned the chocolate fountain as being very cool. For us most importantly our daughter felt that her reception was everything she had dreamed it would be and then some. Thanks for your help. California Chocolate Fountains, I just wanted to take time and say a big THANK YOU to you and your staff for helping to make my grandparents 60th wedding anniversary a success. The fountain was a big hit! Our fountain attendants were both very professional and took very good care of our guests. Kudos to them! We will be having other family occasions....and I will be recommending the fountain for all of them!!! I am always looking for new ideas for my family parties and I am so happy that I stumbled across this. My family and our guests thoroughly enjoyed the fountain. Thank you again. May God bless you all. Ken was amazing to work with!! Very helpful. All of the attendants were helpful, kind and all very good at their jobs. It was perfect. This was a large event 750-1000 people, everything was set up beautifully. We had 3 fountains, people were so excited that they did not even mind waiting their turn. All the food was so fresh and good and of course the chocolate was excellent. A perfect evening!!! The reservation process was Fast and Easy as well as very convenient!!!! The fountain was a HIT! EVERYONE HAD A GREAT TIME AND REALLY ENJOYED IT, ESPECIALLY THE RING BEARER!!!! California Chocolate Fountains, you have a Wonderful Wonderful Company and Staff!!! Everything was terrific. Our attendant, Stacey, was very friendly and very informative. Everyone loved her. She was fun and friendly. I wish I had more events to have her there. What a wonderful idea! It was the highlight of our wedding. Thank you very much! Very professional and timely! Everything was wonderful! Working with California Chocolate Fountains is a painless process. It is an extremely professional operation and, very importantly, guests are so impressed and delighted with the presentation and the wonderful chocolate fountain experience. Thank you! The girls (and parents) are still talking about how awesome the chocolate fountain was! It was one of the best and most memorable parts of the evening for our all-night graduation party. Thank you for your help in making the night special for our girls! Thank you so much for the wonderful service at our wedding! It was the talk of the entire night and weeks after. The attendant was so nice & wonderful and made sure the bride got some yummy treats. I cannot say enough great things about our experience with California Chocolate Fountains. Thanks for making our day so perfect!!!! Ken was very helpful via phone and email. Quick and informative responses. I am still hearing great things from my guests!! Ken was very thoughtful and brought 2 plates of items to the head table during the event, otherwise I might not have had the opportunity to try them, being the busy Bride and all....3 words...FORGET THE CAKE!! The chocolate fountain was worth every penny, it gave the guests something to enjoy and talk about for weeks, for many of them it was a great surprise and a first experience. No left over cake to worry about, no fancy cake-cutting utensils to buy & never use again and what a great photo opp...feeding each other a chocolate covered strawberry!! Ken was a great help, he explained the process very well and our choices were easy to make. The fountain was a big hit at our reception and the presentation was absolutely beautiful. There were many people there who had never had the experience of the fountain and our attendant was a great help in helping them choose and make the best dip possible. Nicole was very kind and helpful. We had lots of oohs and ahhhs about the fountain and the yummy treats. Thank you for adding such a special touch to our event. I have nothing but a glowing report for the chocolate fountain and California Chocolate Fountains. When I searched for fountain rentals, you were the most professional an the most responsive. I couldn't be more pleased with your service. We loved the fountain and will definitely use it again. We will be sure to recommend your company to all of our friends. The Chocolate Fountain was the hit of our wedding reception! Guests continue to remark to us that they "loved the chocolate fountain!" We feel that it added a lot of class and panache to our event. Ken was wonderful, polite and totally self-supporting. That means all I had to do was provide him with an appropriate place to set up, then I was able to tend to my guests. My wife and I loved it, and we have and will recommend California Chocolate Fountains to our friends and acquaintances. Making the reservation was easy over the internet and email. The contract and explanation on the website were easy to understand and answered all of my questions. Our attendant was extremely friendly and helpful. The fountain was a huge hit. One of our guests stayed at the fountain for 30 minutes dipping and eating. Everything tasted wonderful. All the guests and I were very impressed. I thought the price was extremely reasonable for the service and quality. I will definitely recommend California Chocolate Fountains. A perfect "10"...Everything was beautiful! And everything taste delicious! This is one event that will be talked about for many years. When I make my niece's graduation scrapbook, there will be a spread on California Chocolate Fountains. The Chocolate Fountain was wonderful. We had guests at our wedding who don't really like chocolate, however, they loved the chocolate and the fountain that were provided by California Chocolate Fountains. Our attendant was wonderful! Very professional, caring, sweet, warm and considerate. We really enjoyed her presence at our wedding and her professional manor. An enormous thanks for your time and commitment and support of the San Diego Foodbank! You guys were amazing!! The biggest hit of the reception! THANK YOU! Everyone was so friendly, you guys were so wonderful! We "won" a rental for a chocolate fountain at a bridal fair from another company, but with all the added fees that kept being added with each conversation (including bridge tolls!) it was still more than everything with California Chocolate Fountains. You are definitely the best deal in town. We have received so many compliments and thank yous for the fountain; we hadn't told anybody about it so it was a big treat. The guests at the party loved the Chocolate Fountain. Everything was very professional. We look forward to working with you again. Keep up the great work! It was so easy working with California Chocolate Fountains. Our attendant, Stacey, was incredible. She was friendly, professional and informative for our guests. My initial conversations with her before the event eased my mind. She was so on top of things! The fountain was a HUGE hit, as we knew it would be! We have already had inquiries about your company and will definitely pass along your info. Great service! Every aspect of doing business with your company was wonderful! The reservation process was so easy! The online video was fantastic and really highlighted the fun of the fountain! You were great at getting back to us -- both via email and phone. The chocolate fountain was absolutely fantastic! Our guests were lined up to get a taste of the fountain! Our attendant was professional, courteous, fun and helpful! It made our wedding worth it! The fountain was the highlight of the evening! The items to dip were delicious -- especially the rice krispy treats & cream puffs! I'm so glad that we found out about you guys! We can't wait to recommend you and your delicious Chocolate Fountain for our brother's wedding next year! We hope you are available! I was impressed with the prompt responses from the emails I sent and the sense of ease that California Chocolate Fountains gave me through these messages. The fountain was a huge hit. The chocolate was some of the best I've ever had. We have already recommended your company to numerous guests at the reception who were asking about it. It was a hit! Everyone loved the fountain so much, including Damon and me!! All of my friends are still talking about it!!! We are now just thinking up excuses to have a party so we can have the fountain! We loved it so much!! Ken, you were so helpful and courteous!! Thank you soooooooooooooooooooooooo much!!! It was such a faboulous experience!!! You guys are the best!!! Awesome! Everyone commented how great it was and so delicious. Our attendant, Nicole, did a wonderful job! She was so pleasant, yet so professional and kept everything running smoothly. We just wanted to tell you how wonderful the chocolate fountain was at our wedding in Newport Beach. It was definitely the hit of the evening. Our attendants were great. They were helpful, and friendly, and just perfect for our event. The chocolate was delicious - the presentation wonderful, and the containers for the dipping goodies really looked beautiful. Thanks again. We loved it. California Chocolate Fountains...Everyone Loves Chocolate!